Preheat your oven to 350 F degrees. Line a 9x9 inch baking pan with parchment paper. Set aside. In a bowl add the flour and sift the cocoa powder, add the salt then whisk everything together. Set aside. In the bowl of your mixer add the butter, brown sugar, granulated sugar, vanilla extract and eggs. Mix everything together until well incorporated, about 1 minute. Add the beer and mix for another minute. Finally add cocoa and flour mixture and mix until batter is smooth. Pour half the batter in the prepared baking dish, then top with the chocolate chips evenly, then top with the remaining batter. Bake for 45 minutes. To test if it's done, insert a toothpick in the center of the brownies and if it comes out clean, it's done. Let cool completely. Meanwhile, make the buttercream frosting. Add beer to a saucepan and cook on low heat for about 10 minutes until it reduces and thickens, it will be similar to a syrup. You should have about 1/4 cup left. In a stand mixer, cream butter, then add the icing sugar and vanilla extract. Add about 2 tbsp of the Guinness extract and mix well. You might not need all the Guinness extract. Gradually add milk to the frosting and beat until smooth. 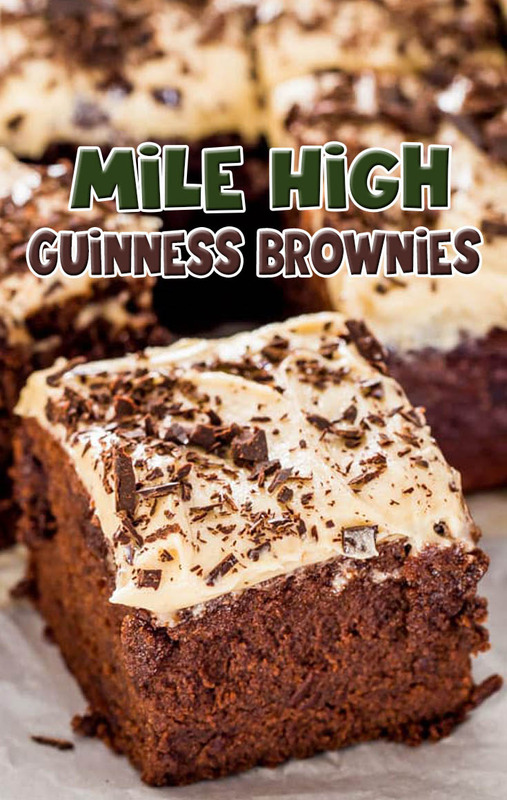 If frosting is too thick add in a bit more milk or the Guinness extract, a few drops at a time. When the brownies have cooled, remove from pan and spread the buttercream frosting over the top. Sprinkle with chocolate shavings, then cut into pieces.